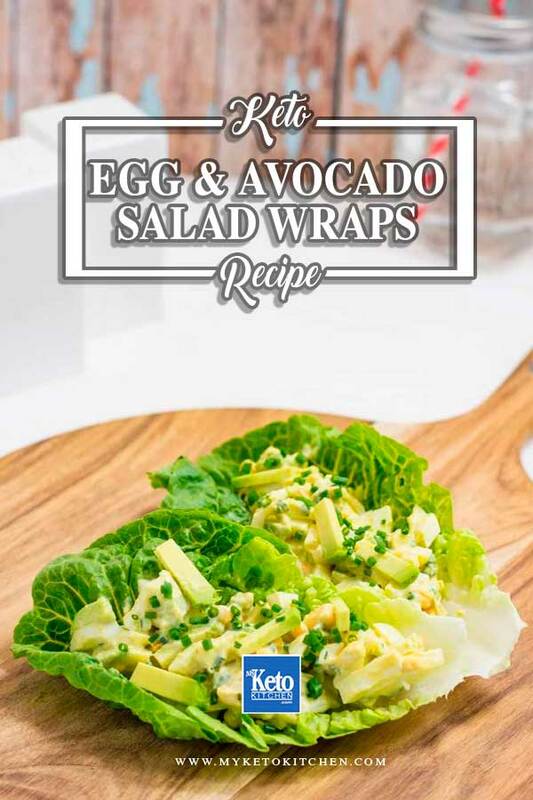 These Keto Egg Salad Wraps with Avocado are perfect for a vegetarian lunch and are full of healthy fats to keep your body fueled. We love taking these wraps on short hikes and picnics, just keep the Avocado Egg Salad separate to the lettuce until you’re ready to eat. We always use a cooler bag to make sure everything stays cold and safe to enjoy. 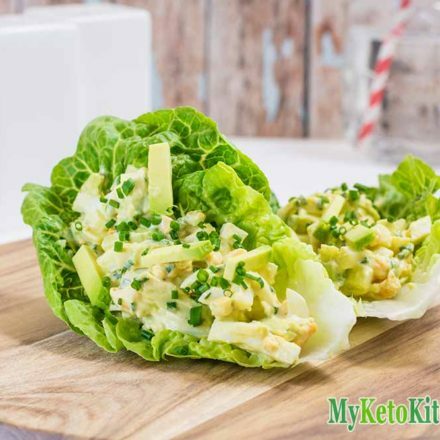 If you love our Keto Egg Salad wraps try our easy recipe for Low Carb Chicken Salad Wraps. Read more about the carbs in avocado and nutritional benefits here. 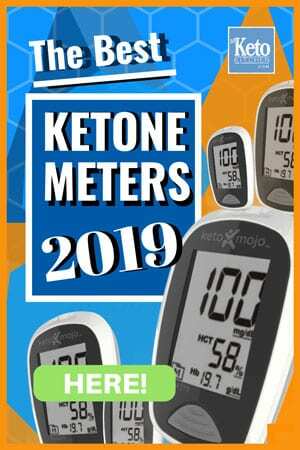 This recipe makes 4 serves, each serve is 2 lettuce leaves and ½ a cup of Avocado Keto Egg Salad. Using an egg slicer, slice the boiled eggs using a dicing method. First place the egg on its side and slice, gently lift the egg, without separating the slices. Place the sliced egg on its base and slice from top to bottom, add the diced egg to a mixing bowl. Dice the avocado and add to the eggs. Add the lemon juice, mayonnaise, chives, salt, and pepper to the bowl and mix gently. Add ¼ cup of the mixture into each lettuce leaf and enjoy. Using an egg slicer, slice the boiled eggs using a dicing method. First place the egg on it’s side and slice, gently lift the egg, without separating the slices. Place the egg on its base and slice from top to bottom, add to a mixing bowl. Add the lemon juice, mayonnaise, chives, salt and pepper to the bowl and mix gently. 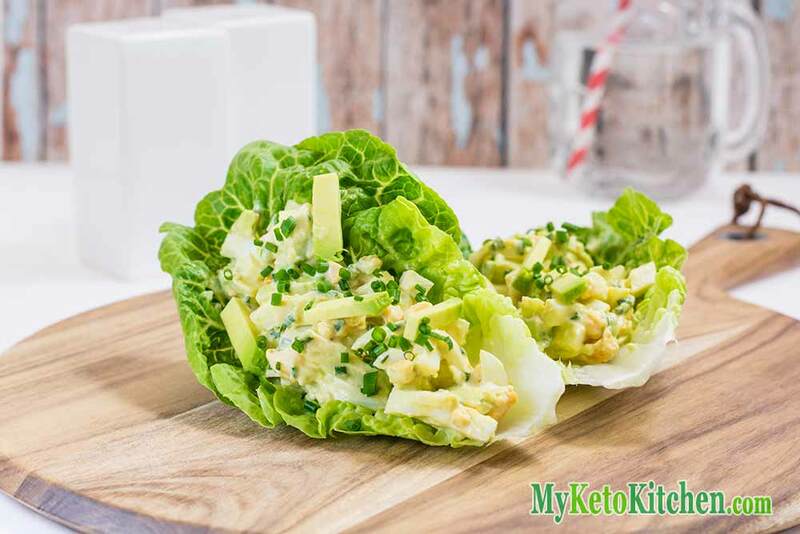 To make a larger batch of this keto egg salad wrap recipe with avocado adjust the servings above.